adingo introduced Fluct in 2010 and currently holds a large portion of Japan’s display and mobile ad inventory, serving over 20 billion impressions to 4000 publishers every month. Fluct also has partnerships with several major international DSPs and Ad Exchanges. 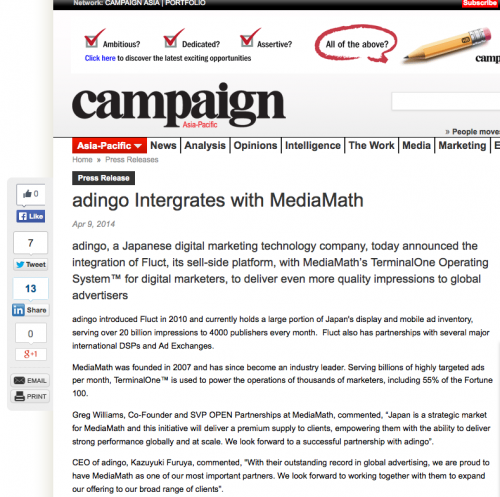 MediaMath was founded in 2007 and has since become an industry leader. Serving billions of highly targeted ads per month, TerminalOne™ is used to power the operations of thousands of marketers, including 55% of the Fortune 100. Note: Campaign Asia-Pacific posts relevant press releases but does not edit them. They appear exactly as provided by the companies issuing them.